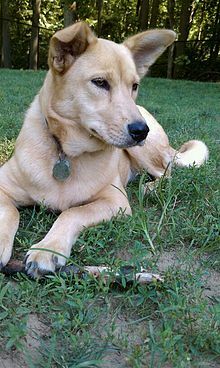 The Carolina dog, also known as a yellow dog, yaller dog, American Dingo, or Dixie Dingo, is a breed of medium-sized, feral dog that lives mostly in the Southeastern United States, especially in isolated stretches of longleaf pines and cypress swamps. Rehoming of Carolina dogs has recently become popular, and they can make good domestic pets with proper socialization. Since 2008, artificial selection efforts to establish them as a standardized breed (usually capitalized as Carolina Dog) has made some progress, with recognition in two smaller national kennel clubs, and acceptance into the breed-establishment program of a major one. Preferable: red ginger with pale buff markings over the shoulders, and pale white along the muzzle. Originally a landrace breed, the Carolina dog was rediscovered living as free-roaming population by I. Lehr Brisbin Jr., though originally documented in American dog-related publications in the 1920s. Carolina dogs show admixture with other dog breeds from Eurasia. Cope (1893) was the first to describe the jaw of this dog from a specimen collected by Moore from a shell-mound on St. John's River, Florida. He was struck by the fact that the first lower premolar was missing and appeared not to have developed. He also noticed strong development of the entoconid of the carnassial. Moore, in the course of various explorations in Florida and Georgia discovered many remains of dogs, apparently of this type. In a large mound on Ossabaw Island, Georgia, he (1897) found several interments of human and dog-skeletons, the latter always buried separately and entire, showing that the dogs had not been used as food. Other dog-skeletons of a similar sort were found by Moore (1899) in aboriginal mounds on the South Carolina coast ... Putnam considered them the same as the larger Madisonville (Ohio) dogs. These dogs were publicized by I. Lehr Brisbin Jr., a senior research ecologist at the University of Georgia's Savannah River Ecology Laboratory, who first came across a Carolina dog while working at the Savannah River Site, which by design was depopulated and secured of all trespass and traffic for decades beginning in 1950. Since 1996, Carolinas can be registered with the United Kennel Club (UKC), which has published a detailed, formal Carolina Dog breed standard.. UKC focuses on hunting dogs and other working dogs, and categorizes the Carolina in their "Sighthound and Pariah" group, along with other breeds such as the Basenji of Africa and the Thai Ridgeback. A breed standard has also been issued by the American Rare Breed Association (ARBA). ARBA includes the Carolina in their Group 5 along with the Canaan dog and the New Guinea singing dog. In July 2017, the American Kennel Club (AKC, the largest dog breed registry in the United States) accepted the Carolina Dog breeding program into its Foundation Stock Service (FSS), the first step toward official AKC breed recognition. AKC has the dog listed under their "Hound" group. Carolina dogs are a medium sized; height ranges from 17 to 24 inches (45–61 cm), and weight from 30 to 65 pounds (15–20 kg). The ears are characteristic and are erect, very long, and moderately slender, tapering way up to elegantly pointed tips and they can be individually turned to the direction of any sound, providing extremely sensitive hearing. The dog ranges in build from muscular yet slender and graceful to somewhat stockier animals. The dogs legs are also graceful but strong. The hind midsection is firm and narrow. The overall build in a healthy, properly fed Carolina dog is svelte to somewhat stockier, strong and athletic. Paws are relatively large. The snout and the notably elongated, fox-like ears are spitz-like. The tail is usually upturned and often has a hooked kink in it. The coat is usually short and smooth, characteristic of a warm-climate dog. Colors vary, and may include reddish ginger, buff, fawn, black-and-tan, or piebald with or without white areas on toes, chest, tail tip and muzzle. The eyes are at an oblique angle and almond shaped. The eyes vary in color, but are usually dark brown or medium to dark orange. The area along the edges of the eyes is often (but not always) a distinctive black "eyeliner" coloration which becomes more pronounced by contrast in lighter-colored dogs. The lips are often black, even in light-colored dogs. Frequently, puppies have a melanistic mask that usually fades as the adult coat comes in. Female Carolina dogs have three estrus cycles in quick succession, which settle into seasonal reproductive cycles when there is an abundance of puppies. This is thought to ensure quick breeding in the wild before diseases, like heartworm, take their toll. Some pregnant dogs also dig dens in which to give birth. Unlike domesticated dogs, wolves, or coyotes, pregnant female Carolina dogs may dig elaborate dens. After giving birth or while pregnant, the dog carefully pushes sand with her snout to cover her excrement. This also helps to evade wolves and coyotes, showing further behavioral adaptation to the wild. Brisbin noted that only the Australian dingo and one ancient Korean breed of dog exhibit this behavior. In 2013, a study looked at the mitochondrial DNA (mtDNA)[a] haplotypes[b] associated with samples of the Carolina dog. The study showed that 58% of the dogs carried universal haplotypes[b] that could be found around the world (haplotypes A16, A18, A19, and B1), 5% carried haplotypes associated with Korea and Japan (A39), and 37% carried a unique haplotype that was not recorded before (A184) and that relates to the a5 mtDNA sub-haplogroup that originated in East Asia. 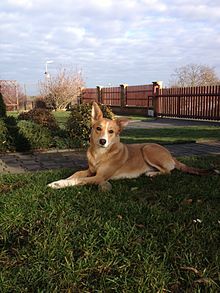 As the Australian dingo and the New Guinea singing dog belong to haplotype A29 that relates to the a2 sub-haplogroup, there is no genetic relationship in the mtDNA. Also in 2013, another study of several dog breeds in the Americas — among them the Carolina dog, the Peruvian Hairless Dog and the Chihuahua indicated an ancient migration from Asia. In 2015, a study was conducted using mitochondrial (female lineage marker), Y-chromosome (male lineage marker), and autosomal genetic markers in 4,676 purebred dogs from 161 breeds and 549 village dogs from 38 countries. The study tested for the degree of admixture with European breed dogs. The study found no yDNA haplotypes that were indigenous to North American dogs outside of the Arctic. However, the mtDNA of Carolina dogs contained between 10% and 35% pre-Columbian ancestry (mtDNA haplotype A184) that clustered with East Asian dogs. Brisbin proposed that the some of the Carolina dog's ancestors arrived with the first, prehistoric Americans. In 2018, a study compared sequences of fossil North American dogs with fossil Siberian dogs and modern dogs. The study indicates that dogs entered North America from Siberia 4,500 years after humans did, were isolated for 9,000 years, and after contact with Europeans these no longer exist because they were replaced with Eurasian dogs. The pre-contact dogs exhibit a unique genetic signature that is also now gone, with their nearest genetic relatives being the arctic breed dogs. Three Carolina dogs in the study exhibited up to 33% pre-contact/arctic lineage, however the study could not rule out this being the result of admixture with modern Arctic breed dogs. ^ Mitochondrial DNA (mtDNA) passes only along the maternal line, and can date back thousands of years. See Arora, Devender; Singh, Ajeet; Sharma, Vikrant; Bhaduria, Harvendra Singh; Patel, Ram Bahadur (2015). "Hgs Db: Haplogroups Database to understand migration and molecular risk assessment". Bioinformation. 11 (6): 272–275. doi:10.6026/97320630011272. PMC 4512000. PMID 26229286. ^ a b A haplotype is a group of genes found in an organism that is inherited from only one of its parents. See Cox, C. B.; Moore, Peter D.; Ladle, Richard (2016). Biogeography: An Ecological and Evolutionary Approach. Wiley-Blackwell. p. 106. ISBN 978-1-118-96858-1. ^ Hitt, Jack. "DNA Backs Lore on Pre-Columbian Dogs". The New York Times. Retrieved October 22, 2018. ^ Weidensaul, Scott. "Tracking America's First Dogs". Smithsonian. Retrieved October 22, 2018. ^ a b c "Carolina Dog Dog Breed Information - American Kennel Club". American Kennel Club. Retrieved October 22, 2018. ^ "Old Yeller". NPR.org. Retrieved October 22, 2018. ^ Fox, Michael W. (March 19, 2018). "Natural, indigenous dogs". Animal Wellness Magazine. Retrieved November 15, 2018. ^ a b Allen, Glover Morrill (1920). "Dogs of the American Aborigines". Bulletin of the Museum of Comparative Zoology at Harvard College. LXIII (9): 137. ^ "United Kennel Club". Arienne Associates. 1996. Archived from the original on September 2, 2006. Retrieved October 15, 2006. ^ "Standard of the Carolina Dog". ARBA.com. American Rare Breed Association. Archived from the original on October 13, 2006. Retrieved February 21, 2018. ^ Club, American Kennel. "Carolina Dog". ^ "Carolina Dog". Rare Breed Network. 1996. ^ "Appearance". Carolina Dog Rescue and Conservation Project. Archived from the original on April 14, 2013. ^ Weidensaul, Scott (March 1, 1999). "Tracking America's First Dogs". Smithsonian. Smithsonian Institution. Retrieved October 11, 2006. ^ Brisbin, I.; Risch, T. (1997). "Primitive dogs, their ecology and behavior: Unique opportunities to study the early development of the human-canine bond". Journal of the American Veterinary Medical Association. 210 (8): 1122–1126. ^ "Primitive Dogs of the Southeast". University of Georgia Press. April 13, 2001. Archived from the original on June 14, 2007. Retrieved October 15, 2006. ^ van Asch, Barbara; Zhang, Ai-bing; Oskarsson, Mattias C. R.; Klütsch, Cornelya F. C. (May 9, 2012). "MtDNA Analysis Confirms Early Pre‐Colombian Origins of Native American Dogs". ^ a b van Asch, Barbara; Zhang, Ai-bing; Oskarsson, Mattias C. R.; Klütsch, Cornelya F. C.; Amorim, António; Savolainen, Peter (July 10, 2013). "Pre-Columbian origins of Native American dog breeds, with only limited replacement by European dogs, confirmed by mtDNA analysis". Proceedings of the Royal Society B: Biological Sciences. 280 (1766): 20131142, and Table&nbsp, 1. doi:10.1098/rspb.2013.1142. PMC 3730590. PMID 23843389. ^ Savolainen, P.; Leitner, T.; Wilton, A. N.; Matisoo-Smith, E.; Lundeberg, J. (2004). "A detailed picture of the origin of the Australian dingo, obtained from the study of mitochondrial DNA". Proceedings of the National Academy of Sciences. 101 (33): 12387–12390. doi:10.1073/pnas.0401814101. PMC 514485. PMID 15299143. ^ Oskarsson, M. C. R.; Klutsch, C. F. C.; Boonyaprakob, U.; Wilton, A.; Tanabe, Y.; Savolainen, P. (2011). "Mitochondrial DNA data indicate an introduction through Mainland Southeast Asia for Australian dingoes and Polynesian domestic dogs". Proceedings of the Royal Society B: Biological Sciences. 279 (1730): 967–974. doi:10.1098/rspb.2011.1395. PMC 3259930. PMID 21900326. ^ Pang, J.-F.; Kluetsch, C.; Zou, X.-J. ; Zhang, A.-B. ; Luo, L.-Y. ; Angleby, H.; Ardalan, A.; Ekstrom, C.; Skollermo, A.; Lundeberg, J.; Matsumura, S.; Leitner, T.; Zhang, Y.-P.; Savolainen, P. (2009). "MtDNA Data Indicate a Single Origin for Dogs South of Yangtze River, Less Than 16,300 Years Ago, from Numerous Wolves". Molecular Biology and Evolution. 26 (12): 2849–64. doi:10.1093/molbev/msp195. PMC 2775109. PMID 19723671. ^ Duleba, Anna; Skonieczna, Katarzyna; Bogdanowicz, Wiesław; Malyarchuk, Boris; Grzybowski, Tomasz (2015). "Complete mitochondrial genome database and standardized classification system for Canis lupus familiaris". Forensic Science International: Genetics. 19: 123–129. doi:10.1016/j.fsigen.2015.06.014. ^ Hitt, Jack (July 15, 2013). "D.N.A. Backs Lore on Pre-Columbian Dogs". New York Times. Retrieved July 15, 2013. ^ Shannon, Laura M.; Boyko, Ryan H.; Castelhano, Marta; Corey, Elizabeth; Hayward, Jessica J.; McLean, Corin; White, Michelle E.; Abi Said, Mounir; Anita, Baddley; Bondjengo, Nonokombe; Calero, Jorge; Galov, Ana; Hedimbi, Marius; Imam, Bulu; Khalap, Rajashree; Lally, Douglas; Masta, Andrew; Oliveira, Kyle C.; Pérez, Lucía; Randall, Julia; Tam, Nguyen Minh; Trujillo-Cornejo, Francisco J.; Valeriano, Carlos; Sutter, Nathan B.; Todhunter, Rory J.; Bustamante, Carlos D.; Boyko, Adam R. (2015). "Genetic structure in village dogs reveals a Central Asian domestication origin". Proceedings of the National Academy of Sciences. 112: 201516215. doi:10.1073/pnas.1516215112. PMC 4640804. PMID 26483491. Wikimedia Commons has media related to Carolina Dog.